A renowned bank of Zimbabwe with 60+ branch offices located across the country chose Matrix Gateway Solution for multi branch connectivity. Their mission was to switch over to efficient communication medium, reduce communication cost and continue doing what they are best at – satisfy their customer's needs with innovative financial solutions adhering services, competency and flexibility. Business of regional banking has changed fiercely over the past decade and so the communication technologies. Increasing business growth over the states, have put pressure on customer to expand their branches across the country. Connecting multiple branches across the country is the foremost requirement from the customer for their business connectivity. Using traditional telephony system for making outgoing calls through PSTN trunks, increases a communication overhead for inter branch calling. Migration to VoIP is the inevitable suggestion, but they cannot replace their preinstalled old age telephony set-up. Matrix working along with regional channel partner – Standard Global Communications understood the requirement of the customer and delivered gateway as a solution – SETU VFX Gateway. 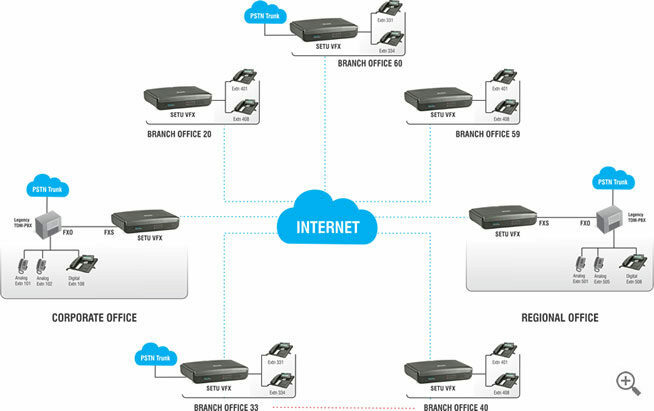 It is a VoIP-FXO-FXS Gateways offers seamless connectivity between VoIP and PSTN networks. Matrix gateways easily integrated between the traditional PBX and VoIP network availing long distance calls without disturbing existing setup and dialing habits. These gateways offered FXO/FXS ports to connect TDM based telephony infrastructure to VoIP and PSTN networks. With Peer-to-Peer application customer place VoIP calls without involving proxy server. IP address of different branch locations programmed with three digit dialing number is defined in the Peer-to-Peer table. Each branch IP address is programmed and shortened with three digit dialing can fetch branch extensions. A branch office connected with other branch office by just dialing a small three digit extension number. For inter branch connectivity, customer was paying heavy PSTN toll charges per call; customer saved hundreds of dollars as our gateways has resolved their problem with each call placed over VoIP network reducing their branch-to-branch call charges. Customer saved thousands of dollars with our device gateways integrated with traditional telephony PBX setup allows the customer to enjoy long distance VoIP calling while retaining their old legacy telephony set-up and number dialing habits. Complete migration to VoIP network would have charged in heavy investments. Easy dialing over inter branch extension numbers has increased collaboration, reduced decision making time among branch offices and increased productivity with cost effective connectivity provided.